We cotton lovers are really quite spoiled, compared with knitters, weavers & crochetters of the past. The 21st century has given us such a great variety of high quality cotton yarns in a never-ending rainbow of vibrant colors! But what to choose? That’s the big question. Mercerized vs unmercerized–what’s the difference? The modern production method for mercerized cotton, also known as “pearl” or “pearle” cotton (that’s how we got the name Pearly Perle!) , gives cotton yarn a sodium hydroxide bath that is then neutralized with an acid bath. 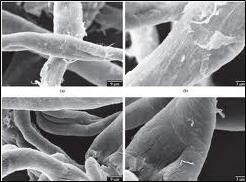 This treatment increases lustre, strength, affinity to dye, resistance to mildew and shrinkage. Mercerized yarns more readily accepts dye and hold the color longer. Cotton with long staple fibre lengths responds best to mercerization. Our Pearly Perle yarns fit the bill 100%! It’s strength makes Pearly Perle a great choice for firm sturdy fabrics such as table runners and place mats or structures that can put stress on the yarn such as closely sett doubleweave or rep weave. If it’s not mercerized (see above) then it’s got to be unmercerized! So what’s the difference? Mercerization made cotton easier to dye, but it also make it less absorbent—ironic huh? Unmercerized cottons retains the natural look of cotton and increased absorbency. Click Here to learn more about what makes cotton absorbent. 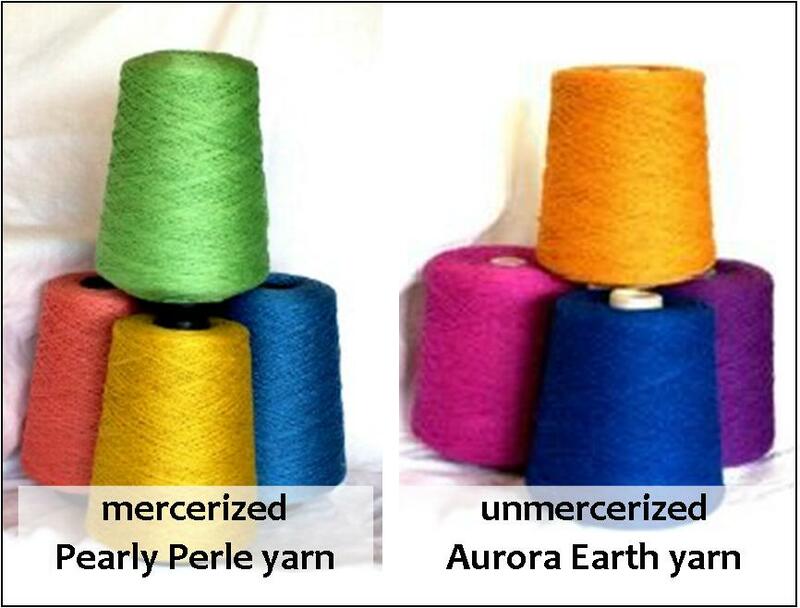 Aurora Earth is an unmercerized cotton. Aurora Earth is a great choice for a weaver’s favorite—the hand towel. It is also great for napkins, bread cloths, and other absorbent fabrics. It is available in over 60 solid and 6 variegated colorways. We also carry a wide variety of organic unmercerized cottons such as Fox Fiber 10/2, Pakucho Dark 10/2, Pakucho Light 10/2 and Ecocot. Organic cottons retain a lot of the cotton’s natural wax which leaves your fabric with a rich butter feeling that is still highly absorbent. Garments made out of organic unmercerized cotton are dreamy. Both mercerized and unmercerized yarns are extremely affordable making it easyto throw on long warps and still do plenty of sampling before you begin your project. You will remember to sample, right? If you don’t’ feel like it better get one of our kits to make sure your project comes out perfect! Next Post How Do I Get Great Colors? By Cheating Of Course! As you know, Aurora Earth is my favorite cotton yarn. But I have gotten hooked on Pearly Pearl for placemats and runners. They are both excellent cotton yarns and I love them both. Some of the information on this article is incorrect. Mercerization does not reduce absorbancy – it actually increases it. The reason that some mercerized yarns are less absorbant is because they are often more tightly twisted during spinning.